Famed for her Modernist paintings, Georgia O’Keeffe quietly trail-blazed a path of organic, minimalist living. Above: O&apos;Keeffe&apos;s kitchen and pantry blend efficiency with neutral colors and streamlined style. YOU CAN HARDLY SET FOOT in northern New Mexico without hearing about Georgia O’Keeffe. The woman who lived by her own rules and established a distinctive personal style spent nearly 60 of her 98 years living and painting near Abiquiú. In that stretch of land between Santa Fe and Chama known as O’Keeffe Country, her abstracted depictions of piñon-studded hills, the painted desert, and undulating rivers come to hyper-real life. In the 31 years since her death, O’Keeffe has remained enduringly cool. In fact, she’s having a global moment, with a huge new exhibit that debuted at the Tate Modern in London and another at the Brooklyn Museum, each with its own weighty companion book reexamining her art and her life. A bohemian before boho was a style you could buy at the mall, she was a celebrated modernist in her public life, and the ultimate minimalist at home. And what an interesting home it was. 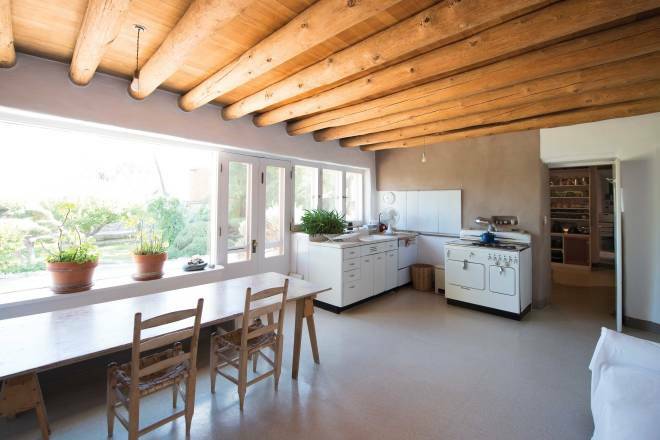 I’m all about food, but not what you’d call artsy, so I was blown away when I found out that O’Keeffe had a magnificent kitchen garden at her house in Abiquiú, which she bought because it had water rights. Who buys a second house 15 miles away from their Ghost Ranch house—just to grow stuff to eat? Was there really this whole other domestic-arts side to O’Keeffe that I knew nothing about? Could it be that she and I actually had something in common? But it was even more than that. O’Keeffe was a DIY Pinterest dream girl. Organic gardening, canning and pickling, grinding wheat, and making yogurt—she did it all. Intrigued, I hit the road on a pilgrimage traveled by thousands over the years. Most of those who go to see O’Keeffe’s Abiquiú house, a designated national monument, seek a glimpse of what inspired her art. They want to connect with her creative soul and to spy into the private life of a famously private famous person. Not me. I came to see where she planted tomatoes, what was in her pantry, and how her kitchen was laid out. I needed to know if she was really one of the founders of my 21st-century foodie tribe. GEORGIA O&apos;KEEFFE&apos;S BACK-TO-BASICS approach to eating began early. Born on a 600-acre farm in Sun Prairie, Wisconsin, she and her sisters worked in the family garden while the men planted corn and wheat. The girls cooked and served straightforward meals in the farmhouse her father built. She even drew artistic inspiration from it. Was she thinking of the Sun Prairie orchard when she painted Apple Family, around 1920? Some of the artwork’s apples are bulbous, perfect globes, flaming red; others are squat, streaked with yellow and red in the creases of their wide ribs. Was she remembering the family garden when she painted a glistening blue-purple-black eggplant still attached to a brilliant green branch? And what inspired her to capture in pastel something far more exotic: an “alligator pear,” just a hint of green on the belly of its smooth skin, the missing stem exposing a dark dimple at the base of its neck? The Abiquiú home and studio are overseen by the Georgia O’Keeffe Museum in Santa Fe and are open for tours from March through November. On the wintry day I arrived, the director of historic properties, Agapita Judy Lopez, graciously agreed to take down the CLOSED sign and show me around. That meant I had a tour guide all to myself. I could linger over details like her space-age KitchenAid dishwasher and ask all the weird questions I’d be too shy to ask in front of other people. Lopez knows more about O’Keeffe’s Abiquiú and Ghost Ranch houses than nearly anyone. Her grandfather Esteban Suazo tended the Abiquiú garden and grounds for “Miss O’Keeffe,” as they called her, from the 1950s until he died in 1981. Her mother, Candelaria, cooked for the artist. And Lopez worked as her personal assistant, then secretary and, eventually, business assistant. She pointed out the sluice gates that open every Monday during the growing season. Just as in her father’s time, water from the Acequia del Pueblo still flows through stone-lined ditches, dousing the chard, kale, lettuce, squash, peas, and tomatoes before turning to soak the flowers and fruit trees. O’Keeffe was committed to growing without pesticides. One year, worms in the apples bedeviled her. “If you spray that tree, then you could have better apples,” Lopez told her. The artist wouldn’t hear of it. “I just eat around them,” she replied. O’Keeffe’s passion for gardening owed something to necessity. In 1940, she settled happily into her first house, Ranchos de los Burros, at Ghost Ranch, but the desert soil and limited water meant she couldn’t grow her own vegetables. In those days, if you wanted fresh produce, you had to drive more than 35 miles to Española, over unpaved roads that were often impassable after a summer monsoon. During World War II rationing, there might be nothing available in the stores when you got there. If she couldn’t eat the way she wanted to, O’Keeffe worried she wouldn’t be able to stay at Ghost Ranch. And O’Keeffe always—always—lived the way she wanted to. In 1945, after years of trying, she persuaded the Catholic Church to sell her the crumbling ruins of an adobe house in the village of Abiquiú, south of Ghost Ranch. Abandoned years earlier, it was unlivable. The roof had collapsed. Walls were crumbling. But residents of the village had planted gardens in its courtyard, keeping the property’s water rights alive. The garden began to take shape in 1946, even before work started on the house. The beds were laid out by Maria Chabot, who managed the Ghost Ranch house for O’Keeffe. Her hand-drawn plan included a ring of fruit trees inside the garden wall: peach, apple, apricot, pear, prune, nectarine, and cherry. Several are still there. I thought of that food-first planning as Lopez guided me into a dark storage room that held two deep freezers: a gloriously retro double-door Hobart and a sleek, chrome-accented Maytag. What amazing equipment for a rural outpost in the 1940s. And for a woman who essentially lived alone! All winter long, that freezer was loaded with vegetables that could be brought back to life with a quick steaming. From there, Lopez led me into the extremely well-organized pantry, a room nearly as big as the kitchen itself, lined with shelves holding casseroles, pitchers, and scales. There were two giant stainless-steel yogurt makers that filled me with jealousy, and eight boxes of canning jars I imagined full of apple butter, raspberry jam, and stewed tomatoes. There were three stoneware pickling crocks, the same kind on sale today at the suddenly chic Bode’s General Store down on the highway. If she were alive today, I’m betting O’Keeffe would have kombucha brewing in one of those crocks. The kitchen was full of light pouring in from a wall of windows and a set of French doors that led out to a little yard. The room itself was fairly empty and had almost no counter space. And no cabinets? Lopez reached for what I thought was some kind of minimalist wall hanging and opened the door of what turned out to be a white metal cabinet sunk into the thick adobe wall. Inside were plain white dishes, simple tumblers, and champagne flutes that looked as though they could have been ordered from Crate and Barrel last month. “She approached her food and her presentation on plain white plates, very similar to how she approached her artwork,” he said. And she liked her food cooked simply. Lopez and Wood both described O’Keeffe loving the flavors of fresh herbs and produce—and being very aware of their nutritional value. She cherished summer salads. She liked vegetables steamed until cooked, but still crisp, and served with just a splash of butter or oil, salt, and pepper. She wanted their distinct flavors to shine through. Once the Abiquiú house was completed, O’Keeffe divided her time between the two houses, spending summers at Ghost Ranch and winters in Abiquiú. One of her younger sisters often came in the summers to house-sit in Abiquiú and tend the garden. Staffers trucked fresh produce from Abiquiú to Ghost Ranch while she stayed there. O’Keeffe brought a lifetime of traveling and eating to Abiquiú and planted a garden that reflected it. She grew yellow pear tomatoes, purple basil, and lovage. “Some of that stuff was pretty exotic for Abiquiú,” Lopez said. She loved dandelion greens, beet tops, and kale, the trendy superfood of the new millennium. Looking at the clean white walls of the kitchen and the simple plywood table, I could imagine how striking a simple salad would have seemed. It must have forced the eater to focus on the shapes of the leaves, the color of the tomatoes, the zing of the dressing. ALTHOUGH SHE DIED IN 1986, O’Keeffe’s enthusiasm for food on the vine is still contagious. This June, a new group of interns will tend the tomatoes. For many of the students, the garden opens them to a world of new flavors, like Lopez with her first eggplant. In the fall, she hosts a private harvest festival for the students and their families. At the first one, the students made kale chips. “After that, we couldn’t grow enough kale,” Lopez said. Her influence is also felt at Eloisa in Santa Fe, where Sedlar has created a five-course tasting menu of dishes that pay tribute to O’Keeffe. But plain steamed green beans are not what Sedlar’s customers are looking for, and he has added his own flair to the recipes, taking a basic beet-and-green-bean salad and embellishing it with some of her other favorite ingredients—radishes and watercress—tossing them in a sesame dressing, and presenting them in beautiful poses. After we wrapped up the tour and sat talking in Lopez’s office, she mentioned something I had missed: a little nook in the sunny kitchen where O’Keeffe kept some of her cookbooks. We headed back. A-ha! The nook was hidden by the open door to what O’Keeffe called her “Indian Room.” Cold and dark, with an earthen floor, O’Keeffe hung herbs to dry from its beams and used it as a root cellar. The books in the nook reflected her simple taste, her focus on nutrition, and her sense of adventure. There was The Joy of Cooking (the baby blue one) and The Tassajara Bread Book (O’Keeffe milled her own flour and baked her own bread). Tante Marie’s French Kitchen sat next to The Art of Cooking with Herbs and Spices. And there was Cook Right, Live Longer, by Lelord Kordel, a popular nutritionist who had a 1960s-era clinic in Beverly Hills where he advised film stars. I spied a couple of spiral-bound books and, afraid to pull them from the shelf, asked Lopez if they were the Time-Life cookbooks I remembered from my mother’s and grandmother’s shelves. They weren’t, but she smiled and said she did remember Miss O’Keeffe having a set of Foods of the World, those big picture books from the late sixties describing the cuisines of India, Japan, and “Vienna’s Empire,” along with their companions, the spiral-bound recipe books. O’Keeffe kept them in her studio. How interesting that she kept those cookbooks not in the kitchen, but the place where she made her art. I thanked Lopez and drove down the little hill back to the highway, passing the familiar piñon hills but thinking of O’Keeffe in an entirely different way. Imagining her pleasure in an ordinary green bean made me look at her paintings with a new understanding. I wanted to sit and study her little white clouds over a blue sky, quietly appreciating the stunning beauty that we sometimes take for granted. I stopped in at Bode’s, where I saw those stoneware crocks and spent 15 minutes ogling them before deciding I didn’t need to buy a crock today to pickle cucumbers I haven’t even grown yet. But I swore to myself that I would pickle this summer. Georgia O’Keeffe did it! All of a sudden she seemed less like one of the most famous artists in the world and more like a culinary comrade, someone who could commiserate about the horrors of squash bugs, someone I would love to have dinner with. Cookbook author and journalist Gwyneth Doland writes about food, people, and culture from an old adobe in the Middle Río Grande Valley. Cook: Make dishes that O’Keeffe loved—and ones she inspired—with the recipes in Tasting NM. Read: Georgia O’Keeffe: Living Modern, by Wanda M. Corn (Prestel 2017). Explore the artist’s lifestyle through her art, fashion, design, and décor. A companion to the exhibit at the Brooklyn Museum in New York through July, then traveling to North Carolina and Massachusetts. A Painter’s Kitchen: Recipes from the Kitchen of Georgia O’Keeffe, by Margaret Wood (Museum of New Mexico Press, 2009); and Remembering Miss O’Keeffe: Stories from Abiquiú, by Margaret Wood (Museum of New Mexico Press, 2012). O’Keeffe’s former companion writes of their experiences, including shared meals. Georgia O’Keeffe and Her Houses: Ghost Ranch and Abiquiú, by Barbara Buhler Lynes and Agapita Judy Lopez (Abrams Books, 2012). Study photographs of the artist’s homes, along with her paintings of them.